Video demo: Anatoly Kusyakov. Images of the Passing Time. Parts 1-5, 8 (fragment), 9-12. Performed by Kostyantyn Zhukov, bayan (accordion). Video demo: Anatoly Kusyakov. Images of the Passing Time. Three movements: From the Oriental Melodies, Procession, Tornado. Performed by Kinga Brosławska, accordion. Video demo: Anatoly Kusyakov. 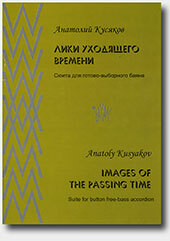 Images of the Passing Time. Parts 3, 4, 12. Performed by http://www.youtube.com/watch?v=n4I9oRFYghk, accordion. Video demo: Anatoly Kusyakov. Images of the Passing Time. (Selected pieces). Performed by Miguel Angel Rumbo, bayan (accordion).